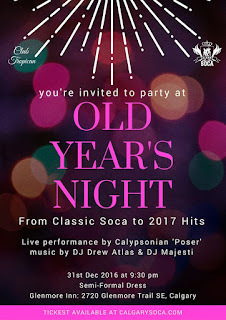 CalgarySoca joins Club Tropican for "Old Year's Night"
Club Tropican & CalgarySoca invite you to celebrate both the best Soca of yester-year, and to get familiar with the newest releases for 2017 Trinidad Carnival. "Back-In-Times" meets "Carnival" at the Glenmore Inn Dec.31st. Live performance by Classic Calypsonian 'Poser' from Trinidad. 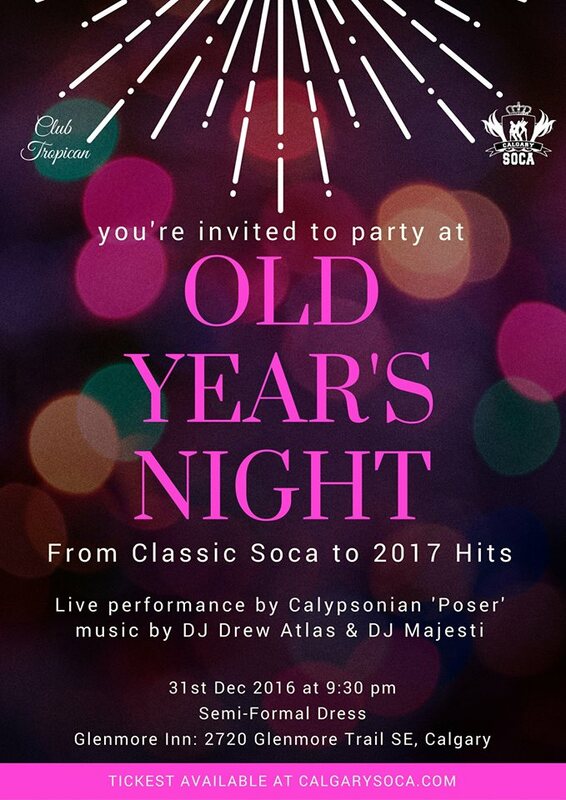 Everything from Oldies to the newest hits delivered by CalgarySoca's DJs Drew Atlas & DJ Majesti. Dance Tix $40.00 ~ Doors for the dance open at 9:30pm. Dress is Semi-Formal. *Dinner packages available as well as Hotel stay.